Ideal for printing cards on most direct-to-card printers. Measuring 3.375” x 2.125”, these cards are the same size and thickness as a credit card. 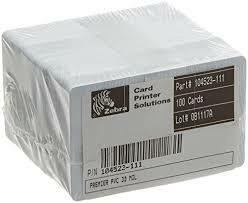 Zebra Premier PVC Cards give you image sharpness needed for vivid colors and detailed, readable barcodes. Poor quality cards often have uneven surfaces and burrs that reduce print quality and cause printhead damage. Zebra guarantees its pure PVC and Composite PVC cards to be compliant with ISO standards for maximum durability applications, to be dust-free, and to have smooth edges, giving you better print quality every time.